April 2015 n Performance & Hotrod Business n 71 Make sure you take into account that most materials do have a nap or material direction. The nap direction is normally indicated on the backing of the material with an arrow. What this arrow indicates is that when you rub your hand in the direc- tion of the arrow on the material, the nap will smooth out; if you rub the material the opposite direction, it will typically raise the material nap upward. When installing material on panels, the nap direction should be down (the arrow will point towards the bottom of the panel). On seats, the backrest nap should point down toward the seat base and on the seat base the arrow should typically point to the rear of the seat. When purchasing carpet material you also will order it by the yard unless you are buying a premade carpet kit. In that case you will order by vehicle manufacturer, model and the number of doors it has, etc. When purchasing yardage of carpet, the widths can vary by the type of carpet and the manufacturer. Common carpet widths are 40, 72 and 80 inches, while carpet pad- ding can come in 36- and 72-inch widths. Headlining materials come in different widths also; the most common being 60 inches on foam back headlining. Vinyls are usually the standard 54-inch widths. My point is simple: when ordering materials, you need to know the dimen- sions in which it comes. The examples I have given you are just the basics when it comes to material choices, but material dimensions for the most part are pretty consistent. 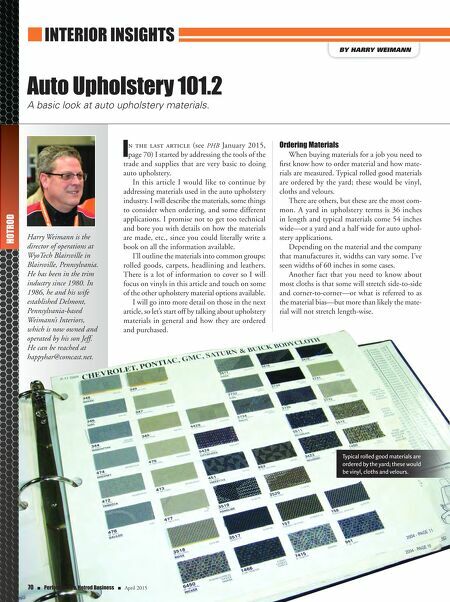 Measuring & Ordering Leather As mentioned, a "yard" in auto uphol- stery terms is 36 inches in length and typi- cally a yard-and-a-half wide, and uphol- sterers generally measure everything by the yard. But leather comes in hides; they are ordered in either full or half hides and are sold by the square foot. 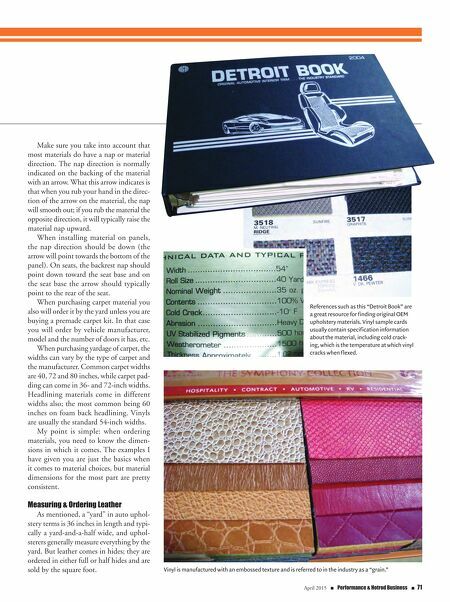 References such as this "Detroit Book" are a great resource for finding original OEM upholstery materials. Vinyl sample cards usually contain specification information about the material, including cold crack- ing, which is the temperature at which vinyl cracks when flexed. Vinyl is manufactured with an embossed texture and is referred to in the industry as a "grain."